A.K. 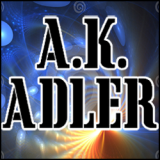 Adler is a science fiction author based in Sydney Australia. "Love at first sight is so much easier when time moves in the right direction"
Rebecca has just met Mark, and thinks he might be her ideal man. He's funny. He's smart. He has a time wormhole in his telephone that gives them access to unimaginable wealth. These all qualify as 'PROS'. But there's also the possibility that he may be destined to murder her. Which, by any standard, is one for the 'CONS' column. Disconnected - a comedy thriller with a twist of romance. And it's about time too.